We had another fairly long day of walking today as we wanted to make sure the final kilometres into Santiago weren't too onerous. For the second day running (I think) we were on the road by 7am, and stopped for breakfast at around the five kilometre mark. 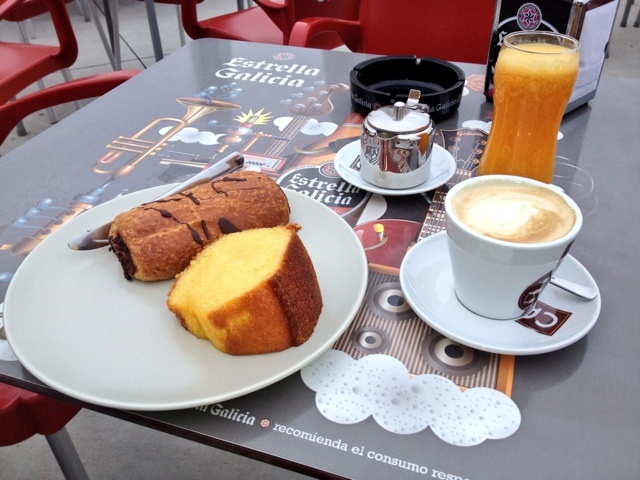 When you're walking a 30+ kilometre day this means that the walk after breakfast isn't so daunting: conversely it is hard to enjoy coffee and orange juice when you know you've got a long day ahead of you, and so the hour of walking helps settle the mind, as much as anything else. The Potomac College group were much friendlier today, saying hello as they passed, and when we stopped for our second coffee break of the day they were already there, sat on a lovely outside space overlooking a field full of dairy cows. I told Kurt we'd have a whip-round if he'd jump over the fence and milk one of the cows. Cue lots of encouragement from the Potomac lot, with one of their teachers egging Kurt on by observing that 'if her head's down, she's ready'. Of course we couldn't let that one pass - the poor teacher's students were told that under no circumstances were they to take his advice in any context other than milking random cattle. 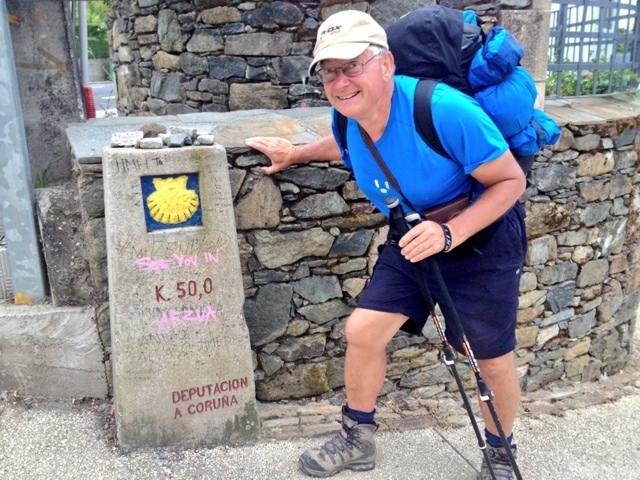 The distance to Santiago markers are being ticked off rather rapidly. It only seems like yesterday that we were at the 160km (100 mile) mark. Most are decorated with a small pile of stones on top, but inevitably the 69km marker had been heavily decorated with chalk and paint, much to the boys' delight. I've never got the 69 thing, and explained to Jonas and Connor that its about as satisfying as going into a department store and being served by a really helpful assistant, but also trying to help her at exactly the same time. It just doesn't work - well for me, at least. And certainly not milepost worthy! Our albergue in Santa Irene is great. There's a mezzanine level with four beds (sheets and towels too!) which we decided would be for the grown-ups, although I'm sure Kim will rue that decision once she has snoring coming from three directions, although she has been known to snore herself - she sounds a bit like a vintage pneumatic Heidelberg printing press - a gentle snuffling sound that I am rather fond of.